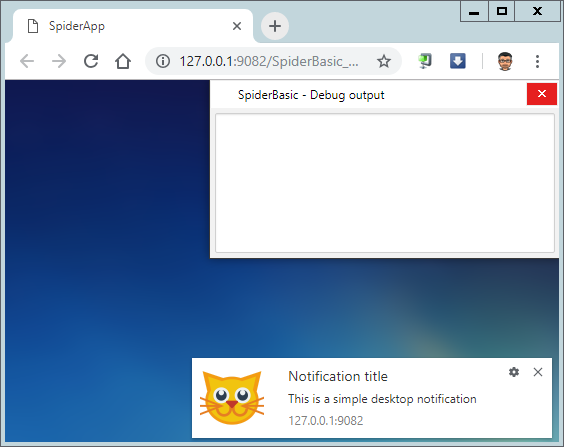 Debug "This browser doesn't support desktop notification"
Using Chrome v68 here ... the page is blank (other than the default blue SpiderBasic background) and the debug window is empty. Paul wrote: Using Chrome v68 here ... the page is blank (other than the default blue SpiderBasic background) and the debug window is empty. please open the console (<F12>) and reload the page. Is there an error message? I deleted it and then ran your code again and this time it worked. I must have been doing something in the past which caused this entry to exist in Chrome.